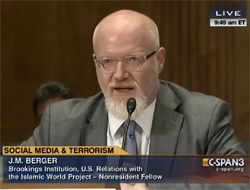 Over at Jihadica, Will McCants has been posting some important pieces on Countering Violent Extremism (CVE), a topic that is taking on an ever-greater focus in Washington with very little clear thought behind it. Will has done something that almost no one else has -- clearly defined CVE and delimiting the scope of the situations in which CVE can even reasonably be considered. I strongly recommend reading those posts in full. Over the last day or two, Will and I have been tinkering with the chart from the original Jihadica post with an eye toward making a fuller visual representation of the concepts discussed in those posts. The two charts below may be useful in seeing the scope of potential CVE target audiences. For more about American jihadists and homegrown violent extremists, check out J.M. Berger's new book, Jihad Joe: Americans Who Go to War in the Name of Islam, on sale everywhere.